The older I get, the more I enjoy Saturday morning. Perhaps its the quiet solitude that comes with being the first to rise, or maybe its the unbounded joy of not having to be at work. Either way, the first few hours of a Saturday morning are most enjoyable. A few weeks ago, I was shuffling toward the garage with a steaming cup of coffee in one hand and the morning paper in the other. What began as a typical Saturday morning turned into one of those lessons that life seems to hand you from time to time. Let me tell you about it: I turned the dial up into the phone portion of the band on my ham radio in order to listen to a Saturday morning swap net. Along the way, I came across an older sounding chap, with a tremendous signal and a golden voice. You know the kind; he sounded like he should be in the broadcasting business. He was telling whomever he was talking with something about a thousand marbles. I was intrigued and stopped to listen to what he had to say. Well, Tom, it sure sounds like youre busy with your job. Im sure they pay you well but its a shame you have to be away from home and your family so much. Hard to believe a young fellow should have to work sixty or seventy hours a week to make ends meet. Its too bad you missed your daughters dance recital, he continued; Let me tell you something that has helped me keep my own priorities. And thats when he began to explain his theory of a thousand marbles. You see, I sat down one day and did a little arithmetic. The average person lives about seventy-five years. I know, some live more and some live less, but on average, folks live about seventy-five years. Now then, I multiplied 75 times 52 and I came up with 3,900, which is the number of Saturdays that the average person has in their entire lifetime. Now, stick with me, Tom, Im getting to the important part. It took me until I was fifty-five years old to think about all this in any detail, he went on, and by that time I had lived through over twenty-eight hundred Saturdays. I got to thinking that if I lived to be seventy-five, I only had about a thousand of them left to enjoy. So I went to a toy store and bought every single marble they had. I ended up having to visit three toy stores to round up 1,000 marbles. I took them home and put them inside a large, clear plastic container right here in the shack next to my gear. Every Saturday since then, I have taken one marble out and thrown it away. I found that by watching the marbles diminish, I focused more on the really important things in life. Theres nothing like watching your time here on this earth run out to help get your priorities straight. Now let me tell you one last thing before I sign off with you and take my lovely wife out for breakfast. This morning, I took the very last marble out of the container. I figure that if I make it until next Saturday then I have been given a little extra time. And the one thing we can all use is a little more time. It was nice to meet you Tom. I hope you spend more time with your family, and I hope to meet you again here on the band. This is a 75 year old man, K9NZQ, clear and going QRT, good morning! You could have heard a pin drop on the band when this fellow signed off. I guess he gave us all a lot to think about. I had planned to work on the antenna that morning, and then I was going to meet up with a few hams to work on the next club newsletter. Instead, I went upstairs and woke my wife up with a kiss. Cmon honey, Im taking you and the kids to breakfast. What brought this on? she asked with a smile. Oh, nothing special, its just been a long time since we spent a Saturday together with the kids. And hey, can we stop at a toy store while were out? 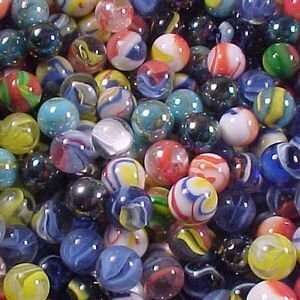 I need to buy some marbles.